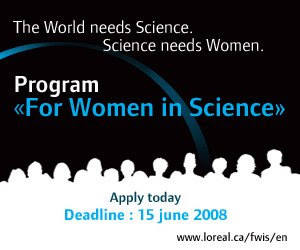 We would like to offer the program's financing to the largest possible number of female researchers. We would like to increase his notoriety in Canada and the number of subscriptions. The deadline is June 15th 2008. These Fellowships of $20 000 and $40 000 allow scientists to develop and pursue a research project in the field of Life Sciences. If you are interested, you should check out the eligibility guidelines. (The application form can be found at that link as well). And what if you aren't Canadian or a resident of Canada? Unfortunately the deadline for the US fellowships was May 9 and the deadline for the UK was May 31. However, It appears that the general application deadline for the 2009 international award is June 30th. Download the application. And here's a video about the program. Why limit it to life science? why not physical science, too? Or computer science? If they wanted to really promote women in science, why pick the one area of science where women are NOT under-represented? badmomgoodmom: The awards are given for life sciences and material science in alternate years. The current award cycle is for life science. I'm not sure how those two categories were selected - maybe because they could be peripherally related to cosmetics in some way?